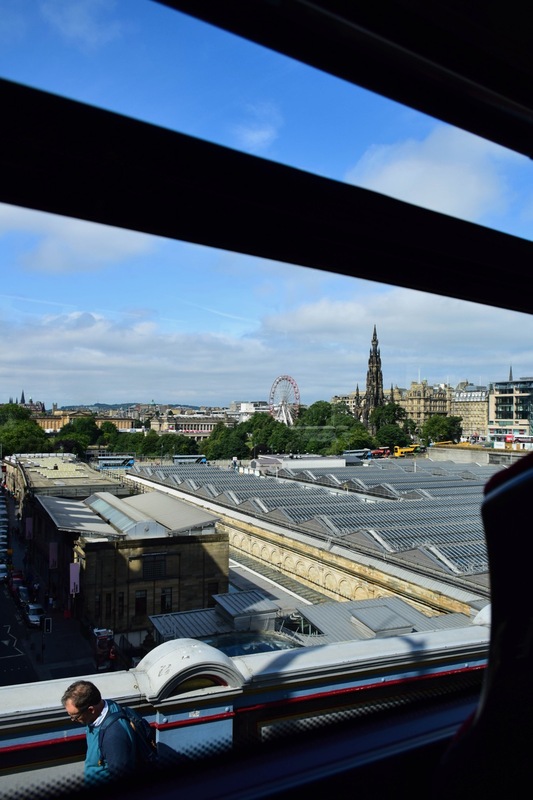 Our second day in Edinburgh started early again, as we had another packed schedule. 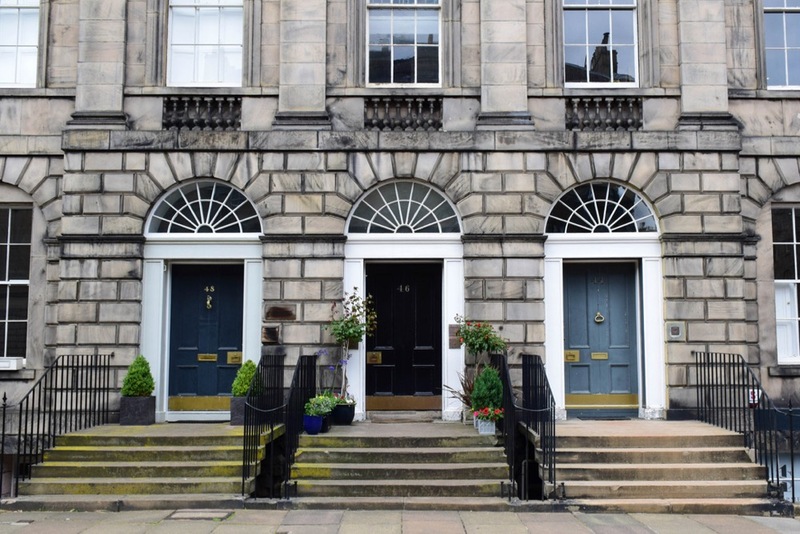 The main mission was to see as much of Stockbridge, a wealthy hip suburb to the north of Edinburgh as time would allow before we went to see Hibernian’s opening match of the Scottish Premier League Season. Hopping on one of Edinburgh’s excellent buses, we headed directly to the Royal Botanic Garden, where as we popped into the bathroom at the entrance, we saw a man who was the spitting image of Eric Trump. The only thing that made me think it may not be him was the fact he had no security around him. But perhaps he really is as stupid as SNL makes him out to be. Either way, it’s an unfortunate man who’s cursed to look like him. 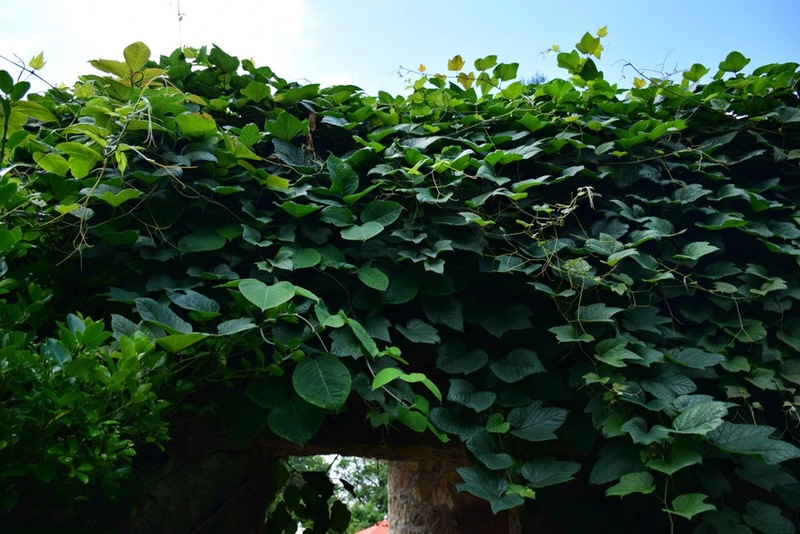 We whizzed through the botanic garden, as I don’t think plants and nature inspire Joe and Kyrah to geek out in quite the same way as Lia and I do, but we did nip into a small museum in the garden where we saw perhaps the worst poetry exhibit in history. 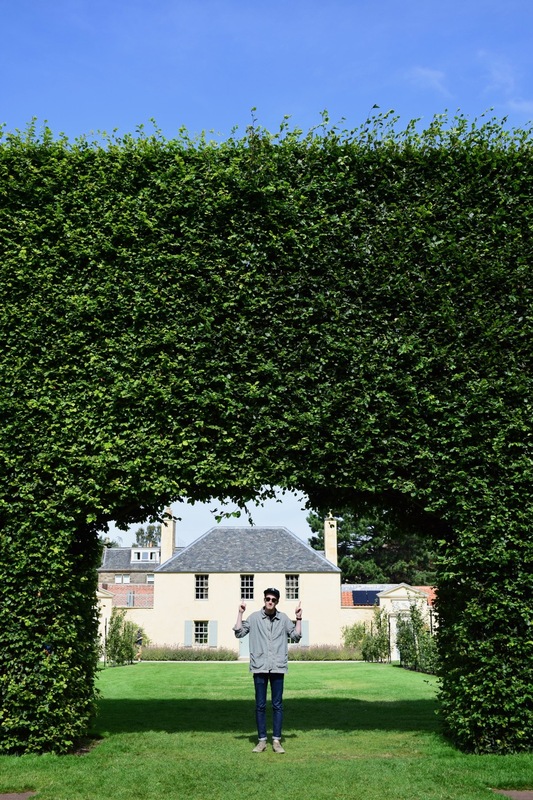 We then found a very tall and somewhat well-known hedge, manicured to perfection, but just disheveled enough to still resemble a real living thing. Beyond the hedge, a small allotment of various fruits and veggies was growing. It took us a while to find the exit from the gardens, because apparently there’s only a gap in the fence at very infrequent intervals, but once we escaped we made our way down into Stockbridge for some lunch at the market. I continued on my sausage streak by eating an exquisite scotch egg, and I caught Lia checking the time on her non-existent wristwatch while waiting for her small paella dish. After lunch, where we sat in a nearby park and definitely didn’t feed the enormous and aggressive seagulls any leftover paella, we moseyed around the neighborhood for a bit of shopping while we digested. Then it was time for football. I’d been so excited to go to a British football match, as I honestly went to so few growing up. 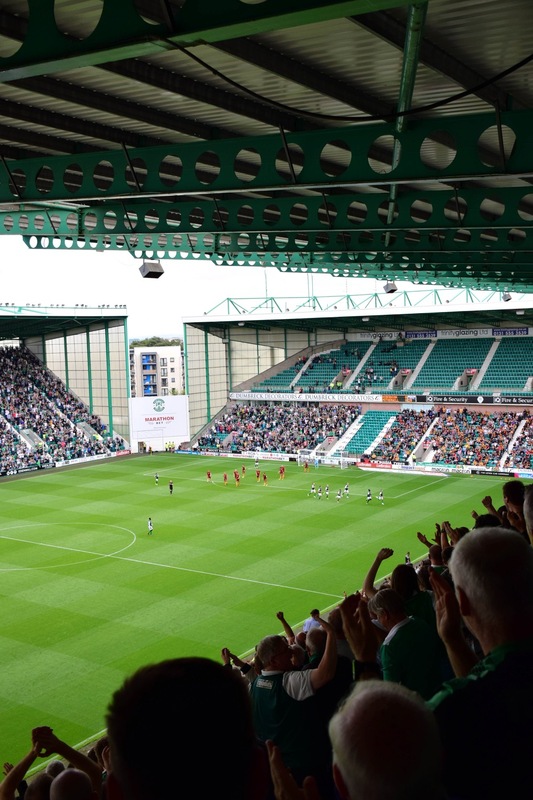 Hibernian’s ground was perfectly nice, and our seats up in the nosebleeds gave us a fantastic panoramic view of the action. Early on, the action threatened to not materialize. The quality of the game was pretty dire, as both of the rusty teams could barely string together a set of more than a few passes. To signal her discontent, Lia found it in herself to fall asleep. At a rowdy football ground. Right at the top of the stands, where the noise swelled and echoed around under the awning. But she can’t fall asleep on a plane. Sometimes I’m truly in awe of her. Even if the game started poorly though, I enjoyed putting my camera’s zoom lens through its paces. 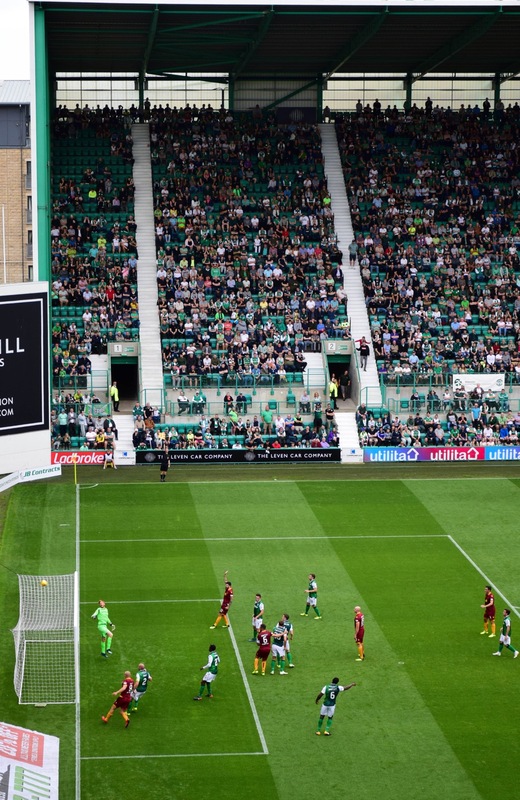 There was finally a bit of excitement when the Hibs won a free kick on the edge of their opposition, Motherwell’s box. And only went and scored! 1-0, about midway through the first half. 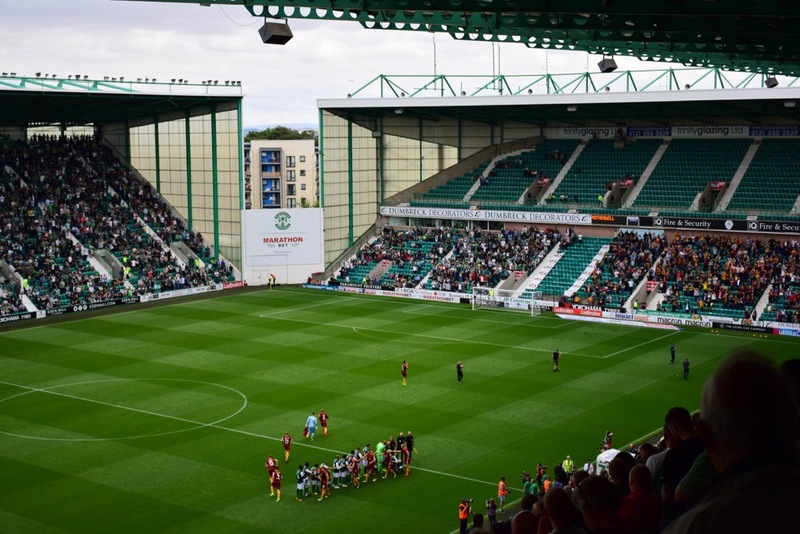 A second goal followed not much later, just before halftime, when Hibs seized possession and quickly moved down the field before converting. The second half, the home team was attacking at our end, so the most exciting goal of the lot was the third, the final nail in the coffin, from a shot outside the box. 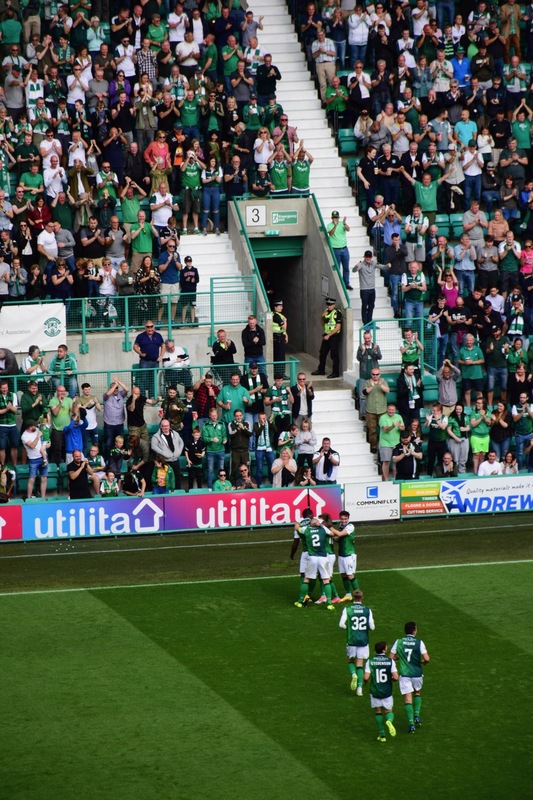 3-0, and a opening day win for the Hibs. Joe had never even seen them win in all the games he’d come to over the past 5 years in the city, so he was practically giddy. 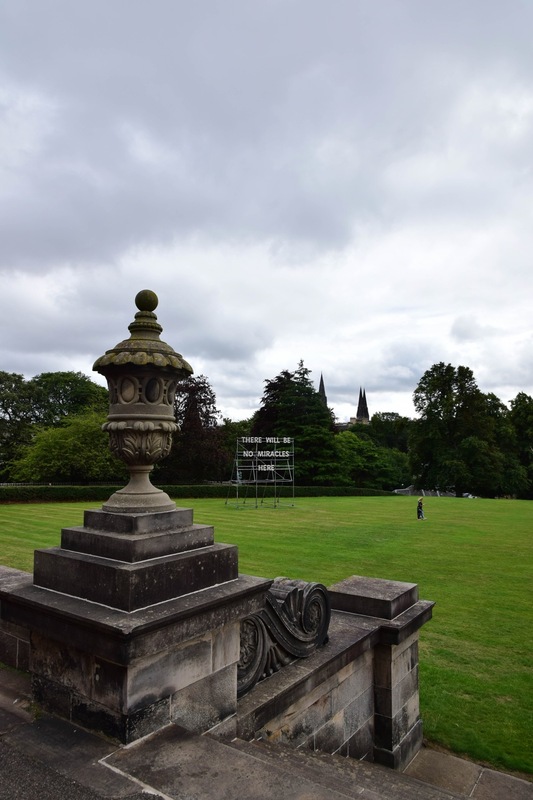 That evening, we went to see our slice of the Edinburgh Fringe Festival, and thoroughly enjoyed it, before experiencing the new Lidl (now with less wooden palettes!) to grab some dinner to make at home, followed by a dessert of the Edinburgh classic, Trainspotting, which I mentioned I’d never seen. We had one more morning in Scotland, which we spent at the slightly underwhelming Scottish National Gallery of Modern Art. The collections they had were fine, just so few. And it was a bit of a trek to get out to. Thankfully the grey day cleared by the time we got downtown, so we were able to enjoy a quick cuppa on the Meadows — Edinburgh’s answer to the Boston Common — just a few minutes from my friends’ flat before grabbing our bags and heading to the bus stop to make our way back to the airport. Each time I leave Scotland, I find myself realizing how much more time I would’ve liked there. One day I’ll go and stay in a house in the middle of nowhere in the Highlands. I’ll swaddle myself in tartan blankets, drive around stunning roads, ramble across the scenic panoramas, and feel safe under the grey skies as I consume ungodly amounts of tea. They say you should start planning for retirement early.